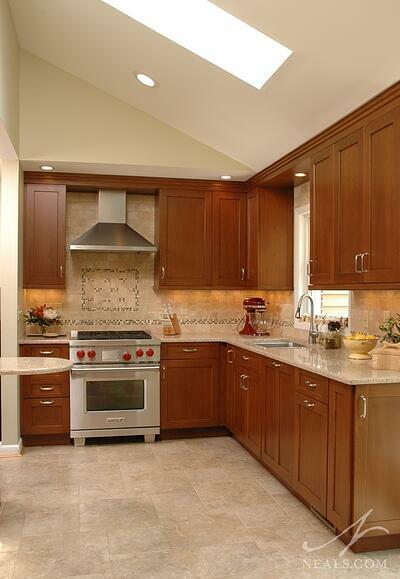 Ceilings are an often neglected component in home remodeling and design. Sure there's nothing wrong with a nice flat expanse overhead, but it's nice to know that you do have some ceiling options. The first important step to determining if a unique or special ceiling is feasible for your project is to make sure your home is structurally capable of accomplishing it. If the ideas below have got you thinking about your ceiling, we recommend setting up an appointment for a consultation to speak with a professional. If you're still looking for inspiration after reading this post, follow Neal's on Pinterest, and check out our Ceiling Inspiration board. 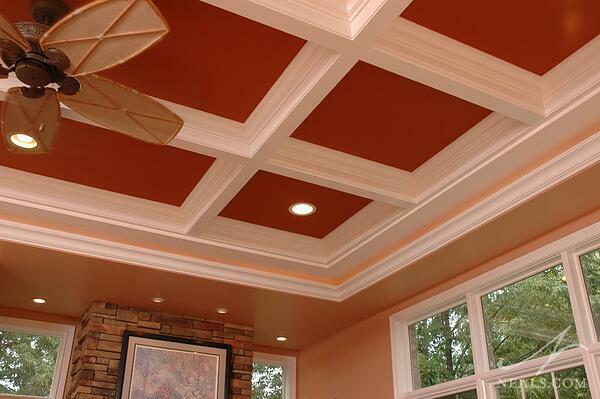 A tray ceiling is a recessed section typically situated in the center of a ceiling. It can be rectangular, round, or polygonal, depending on the dimensions of the room and it's purpose. 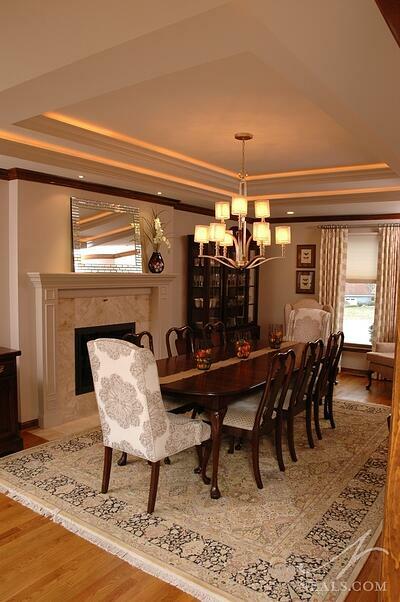 Rectangular tray ceilings are quite popular in dining rooms, for example, like the Neal's Design Remodel project above. 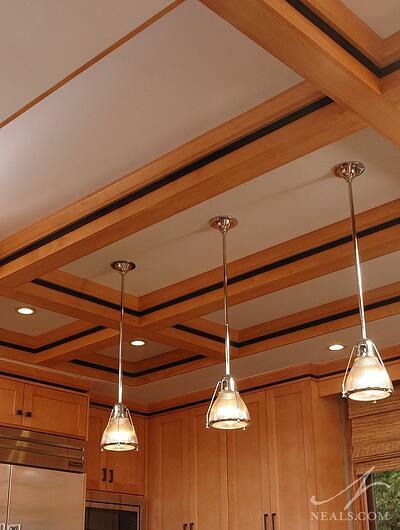 Other than creating visual interest, tray ceilings offer additional options for lighting. Layers of recesses can be "stacked", and each layer can be fit with uplighting for an ambient effect. A "coffer" is a sunken panel, but in ceiling terms, this is means a panel that is set at a higher point than the primary ceiling. Coffered ceilings are typically a grid, with either equally-sized coffers or various sizes to accommodate lighting or to create a design. In most modern cases, the coffers are actually created with the application of moulding inside a large tray ceiling, giving the illusion that each of the coffers are recessed but without the labor thats involve. The trim, much like crown moulding, can be styled in nearly endless ways. Coffered ceilings are typically used in classicaly-inspired interiors, but the choice of materials, or the scale of the grid can be adjusted to create a more modern look, such as the coffered ceiling above. The key to creating the correct look regardless of the specific style is to use moulding or soffits on the outsides of the grid to establish the ceiling's "natural" height. The coffers should then be set at any depth above that. When the center line of your room is the highest point, and the ceiling slopes up in a straight line from both sides to meet that point, you're looking at a cathedral ceiling. The ultimate ceiling type when you're looking for the space to make and impact in your home, catherdral ceilings can be styled in numerous ways to fit your design scheme. Often, the roof's support structure is left exposed inside the room to acheive the cathedral look, but the angle and height of the room is really the determining factor on whether this is needed. The cousin to the cathedral is the vaulted ceiling. Technically, the vaulted ceiling is either one in which only one side of the room goes to the full height, or if the slope of the ceiling doesn't match the slope of the roof. This is often used in ranch-style homes in which the center line of the house is several feet higher than the height of the exterior walls. The term "vaulted ceiling", however, is often used for any ceiling in which the height is more than a single story, so don't be thrown off by its use among realtors to descibe rooms with impressive height. To add further interest to a ceiling, several other techniques can be used, either in combination with the basics above, or on the average flat ceiling. Wooden beams that are not concealed in the ceiling are known as "expossed beams", but that doesn't mean they are always unpainted or rustic. 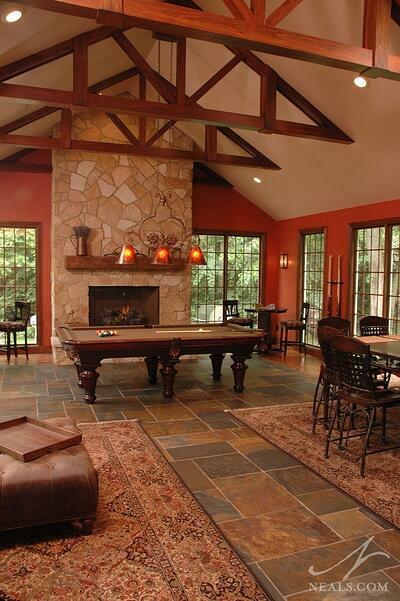 Cathedral or vaulted ceilings can come by exposed beams pretty naturally, but any room can be fitted with the feature. Reclaimed lumber, like the beams and ceiling boards used in the 2015 NARI Contractor of the Year Regional Interior winner above, are the epitome of the exposed beam style. Specially-fabricated pieces, made from any variety of materials, that adorn a ceiling around the connection point of a chandelier are known as medallions. These pieces are very precisely traditional, and can be simple or ornate. The important consideration in medalion choice is how it fits with the scale of the room. Of course this list of ceiling ideas wouldn't be complete without a nod to the sky light. Large or small, set on an angle or not, the sky light has a lot of good things going for it. 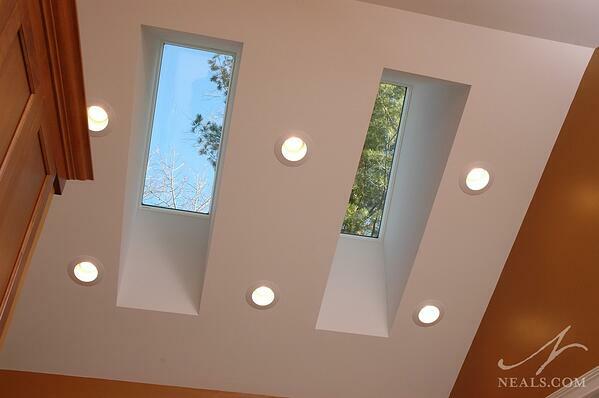 One of the best ways to add natural light to any room, skylights can also maximize views (or indoor star-gazing), and in some homes can help to regulate the temperature. 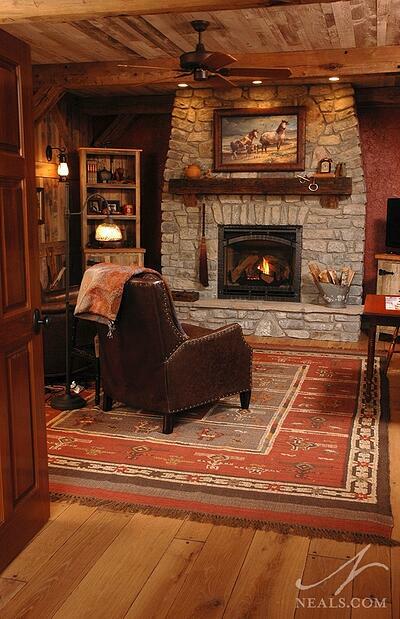 Photos by Neal's Design Remodel, featuring local projects, unless otherwise specified.